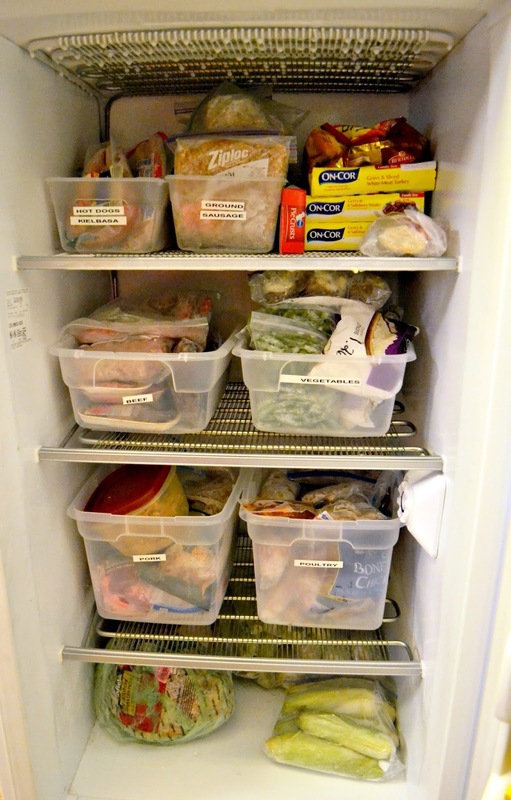 Whether you have a small freezer attached to your refrigerator or a large deep freeze, Choosing the right containers for your space and type of food is important to your saving money and preserving your food for longer term storage. I am doing a series of posts over the next few weeks to help you make the most of using your freezer. Bags, containers, jars, and papers or foils are all options to consider. I actually use them all for different reasons! Make sure you use freezer bags not just your average plastic storage bag. There is a difference in thickness and the freezer bags are designed to prevent air from getting to the foods, and do a much better job of preventing freezer burn. What I use bags for? Almost everything! Dividing meats into smaller portioned packages, such as hot dogs, hamburgers, chicken etc. I also use them for storing frozen veggies and fruits such as peppers, onions, carrots, for soups and cooking as well as fruits that I don't feel like canning. Con's Not as "earth friendly" , continually buying more. 1) Always freeze your bags flat so they stack well. 2) Don't stack bags on top of each other until they are all frozen so they wont' stick together. 3) Lastly, if you are putting them on wire racks line the wire racks with a flattened cardboard cereal box, so the bags don't sag through the wires and freeze to the rack! Pro's: Easy to use, reusable so very affordable. No leakage or spillage. Cons: Takes up a ton of room, so limits how much stuff you can fit in the freezer. Not as much of an "earth" friendly option. Yep! You read it right! Most canning jars are freezer safe. They actually are marked that way on the new cases at the stores now. I use this mostly when one of my jars doesn't seal properly when canning, or if i am storing soups or salsa's. No need to "can' these jars, just put your food in, put on a seal and a ring and pop in the freezer! 1) Make sure it's an actual canning jar and not a mayonnaise jar. 2) Don't fill it to the top! Leave a 1/2 inch of space for expansion as it freezes. Otherwise you'll crack the glass! Con's: Costly if you don't have them already. Takes up space in the freezer. Foil: Is great for keeping out moisture, odors, and air. Makes sure it is a good and thick foil. I like to wrap things that will go straight on the grill or campfire in foil, such as veggies packs with a pat of butter, hobo dinners of sliced potoates, meatballs etc., or to re-wrap meats from the store. 1) Make sure your creases and folds are super air tight. Double roll the seams shut and press all the air out of the corners and creases as much as possible. You may want to put the foil packs into a plastic freezer bag as a double seal . 2)Caution: Do not use foil for high acid foods such as tomatoe based lasagna's, fruits etc. the acid will erode the foil. Pro's: Inexpensive, handy and reusable! Con's: Can't use acidic foods, hard to label the contents on the foil. Freezer Paper: It may seem old fashioned, but it works fantastic! Reynolds makes a freezer paper, but if you get serious about it you can find larger rolls online too. Freezer paper is a thicker white butcher paper that has a plastic side and a paper side. Perfect for re-wrapping those expensive meats from the store! Freezer Tape: Perfect for labeling on ALL your bags, jars, containers and papers! You will never regret keeping a roll of freezer tape on hand! Pro's: tried and true! will keep freezer burn at bay! Can be purchased in large rolls so is affordable over time. Con's : The initial purchase.